The Stewards Company is committed to quality customer service, detailed cleaning, and guaranteed customer satisfaction. With 10 years of history, the company has brought sparkling windows, and clean gutters to thousands of residential and commercial customers in Oklahoma and surrounding area. 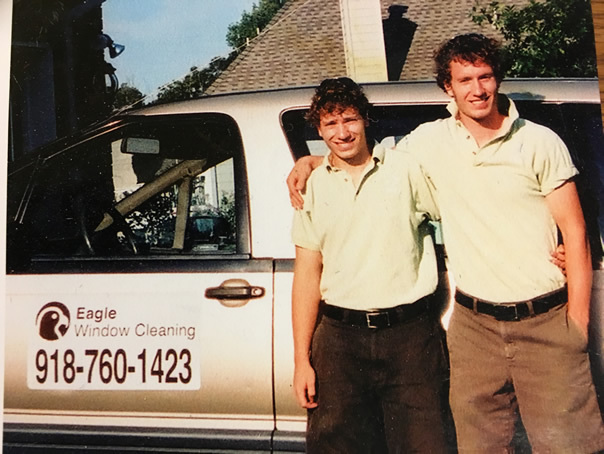 Beginning in 2005, Owen Carr founded Eagle Window Cleaning (now the Stewards Company) in Tulsa, Oklahoma, with the assistance of his little brother, Joel, and only $100 between them. Originally intending only to replace their summer incomes, the boys quickly realized that the company was capable of much, much more. During 2006, The company brought on Anthony DeBella as the primary Operations Manager of the business. In only its second year of operations, the company grew by 200%. the company has continued to grow in each year of operations, increasing its array of services to power washing, and gutter cleaning services.